Modern interior design can feature a wide variety of elements, from clean lines to geometric shapes and monochromatic rooms to bold pops of color. Whether your whole home embodies a modern aesthetic or you’d simply like to add a sleek, minimal window treatment to a room, both our shades and custom drapery are available in many contemporary styles. Perfect as a statement-maker in an otherwise simple room, Flat Roman Shades add the softness of fabric with a flat finish when closed and a neat stack when raised. Even when the shade is down, the permanent bottom fold remains in place, adding a structural element to otherwise simple shades. 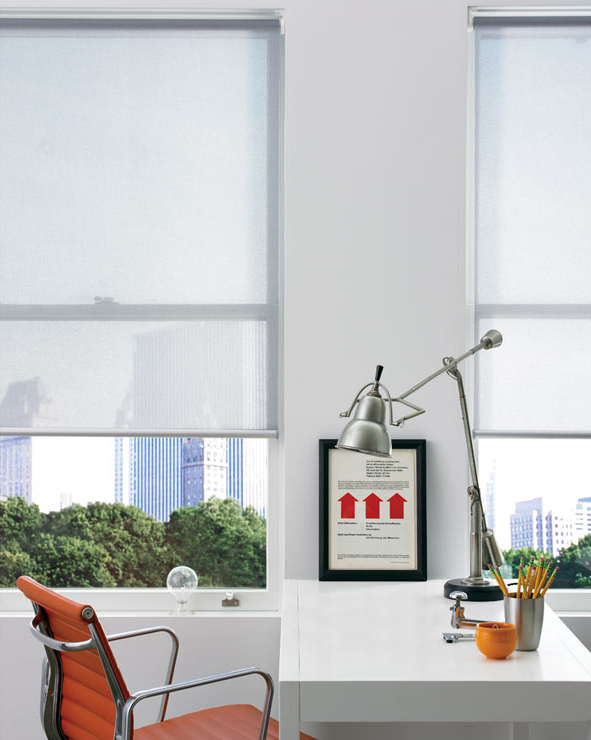 For the ultimate simplicity in design, try Roller Shades or Solar Shades on your windows. These shades create strong, straight lines when closed, and virtually disappear into an inconspicuous roll when raised, preserving the architecture of your window or your view. 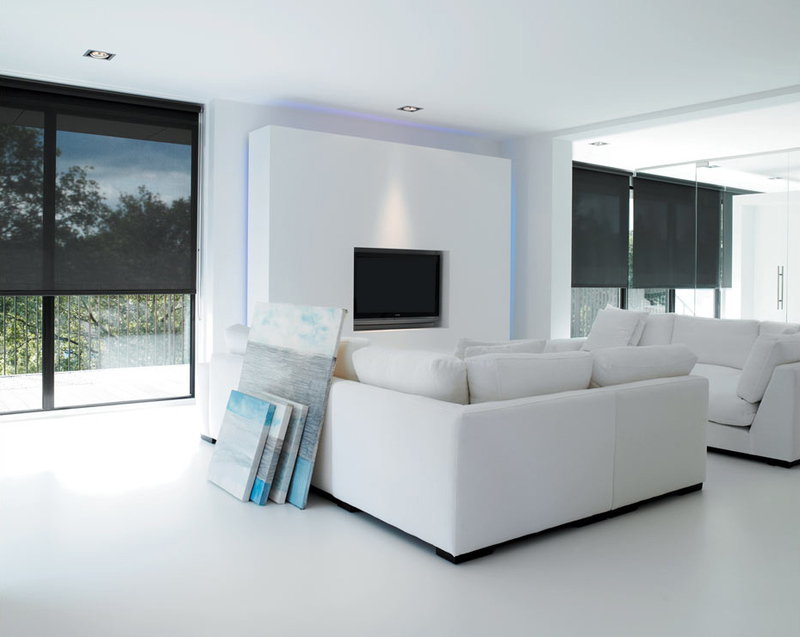 Available in light filtering, UV blocking, and blackout materials, Roller and Solar Shades function well in any setting. Metal finishes lend a distinctly modern, industrial feel to any space. If you’ve chosen Roller or Solar Shades, there are two spaces to add a unique touch of metal: in the brackets, and in the optional exposed bottom bar. Brackets are available in White, Chrome, Satin Nickel, Bronze, or Black, and exposed bottom bars come in White, Silver (shown in the photo below), or Espresso. You can also add a subtle touch of metal to your windows with drapery hardware. Our Steel and Acero collections both offer steel tubing with modern finial options. Grommet Drapes are an excellent choice for an updated style of drapery, and you can coordinate the color of the metal grommets to match the color of the rod. Bring even more structural interest to your window treatments with a geometric print. 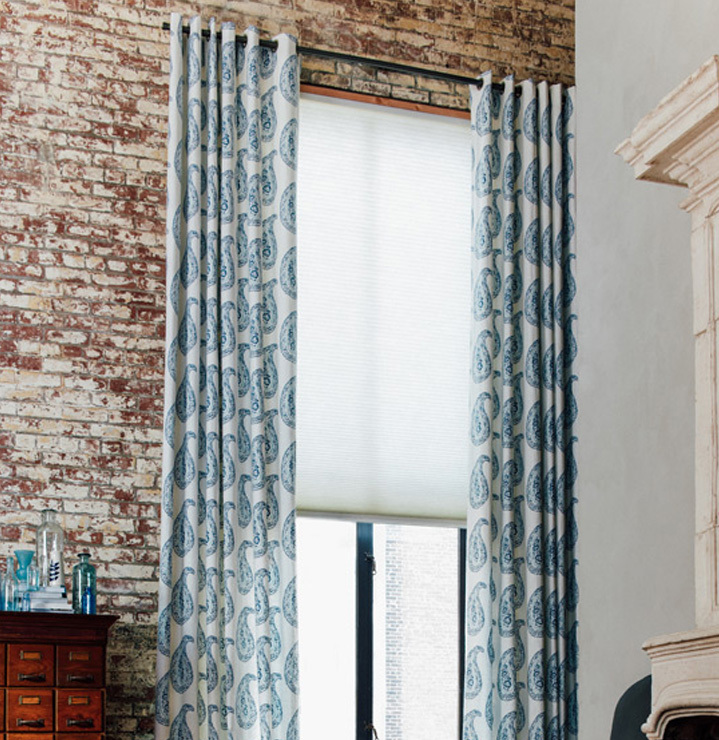 For Roman Shades and Drapery, many of our exclusive designer collections feature geometric patterns, such as The Novogratz, Echo Designs, and Dwellstudio. For a chevron pattern, try Roller Shades in Zig Zag or Chevron fabrics. Even Solar Shades are available in prints, such as the hexagonal pattern in Hive and the elliptical shapes in Orbit. Order as many free swatches of these materials as you like, and you’ll receive in them in 1-3 business days. If you’d like to talk about creating your perfect modern window shades or drapes, please feel free to call us, send an email, or talk to a design consultant in any of our nationwide showrooms.